Like many people, we were wondering just what kind of peak speed was achieved during Koenigsegg’s record-breaking run with an Agera RS. After all, the 277.9mph figure - which makes the Agera RS the world’s fastest production car - was an average of two runs. Now we have our answer: 284.3mph. No, that’s not a mistake. 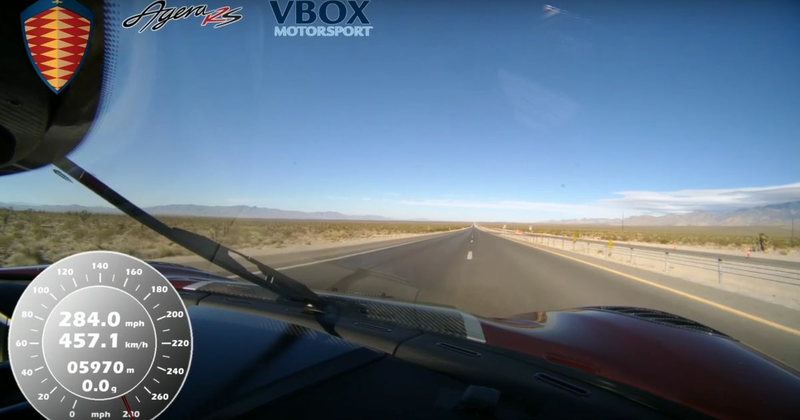 Koenigsegg factory test driver Niklas Lilja hit the incredible speed on a closed road in Nevada on the second run that’s shown in this video, having hit 272mph on the run before. You might find yourself fixating on the speedometer on first viewing, so we’d recommend giving it a second watch to see just how fast the scenery is moving past - it’s mind-blowing stuff. The Swedish hypercar firm confirmed on Twitter earlier today that the Agera’s factory-fitted Michelin Pilot Sport Cup 2s were used for the run, but other than that, we don’t know a huge amount about the feat - full details are expected to be revealed soon. For now, you can consider our hats well and truly doffed to Lilja and Koenigsegg.